America could learn a thing or two from Milwaukee. The city of 600,000 just took a huge step forward that will not only reduce its environmental impact but also help its neediest citizens along the way. 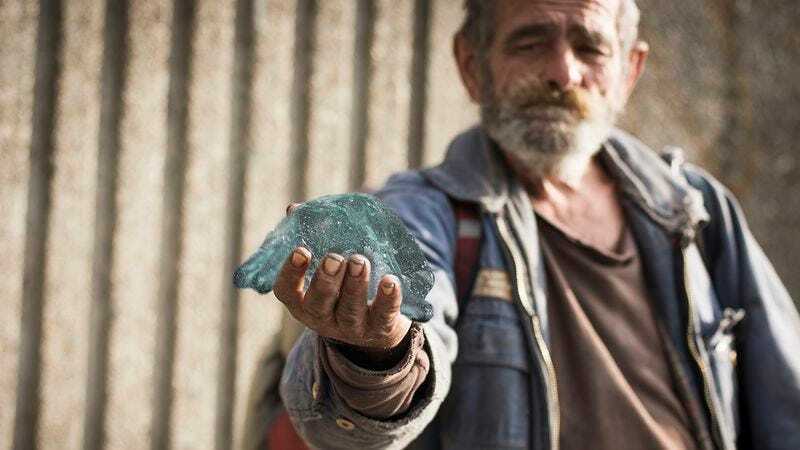 Every week, the Milwaukee Department of Sanitation is running a special program that melts down bottles, jars, and other glass recyclables into glass blobs for the homeless. Whoa. What an incredible way to save the planet and help those in need! With traditional recycling programs, plenty of reusable materials still end up in the trash while cities’ neediest citizens remain without a glass blob to call their own. That’s what makes Milwaukee’s new initiative so groundbreaking, and so important. From now on, homeless Milwaukeeans will always have access to a free blob of glass—day or night, no questions asked. With so much success locally, the department is broadening its efforts on providing blobs to homeless people all across America. They’re now melting down nearly 2,000 bottles every single day—that’s about 600 new glass blobs! Once the blobs have cooled off, they are sent to shelters, soup kitchens, and churches all over the U.S., where they can be put into the hands of those who have fallen on the toughest of times. This is some seriously brilliant innovation. To you, that bottle is just another piece of recycling at the bottom of the bin. But to members of our country’s most underserved and neglected population, that bottle has the potential to be a smooth, dense blob of glass. Major props to Milwaukee for helping to make the world a better place!